(CNN) -- England all-rounder Andrew Flintoff has been ruled out of the World Twenty20 next month and faces a race against time to prove his fitness for the Ashes series against Australia. 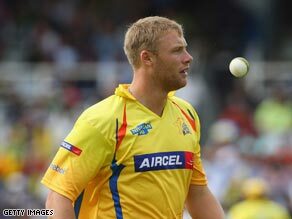 Flintoff's lucrative spell in the IPL was cut short by a knee injury. The injury-plagued Flintoff damaged his right knee while playing for Chennai Super Kings in the Indian Premier League a month ago, but there were high hopes he would be fit for the tournament which starts on June 5. The 31-year-old has been replaced in the squad of hosts England by young Yorkshire leg-spinner Adil Rashid, who has yet to play a senior international game. A statement by the England and Wales Cricket Board (ECB) on Wednesday said that Flintoff was making an "excellent recovery" but would not be risked. "After discussions with his surgeon we have decided that he should continue the remainder of his rehabilitation with physio Dave Roberts, who has overseen his previous rehabilitations," it added. Flintoff was England's key player when they won the Ashes against Australia in 2005 in one of the greatest series in cricket history. He has suffered a series of injury setbacks in the intervening years, but still remains a vital ingredient in the England side as they bid to win back the Ashes later this summer. The first Test starts in Cardiff on July 8, but in Flintoff's absence England have swept aside the West Indies in both their Test and one-day series ahead of the World Twenty20. "There is a lot of cricket still to play this year and it is important Andrew is fully fit for it," national selector Geoff Miller told Press Association.